Two years after returning from “The Tough One”, I was ready to try it again. I sold the Suzuki with almost 100,000 miles on it and bought a new 1982 Honda 1100cc Gold Wing. I didn't know a great deal about setting it up for thousands of miles of muddy gravel roads, so I didn’t do anything to it. It was totally stock. I expected to ride it on more than 2,000 miles of gravel roads on this trip, which I figured would show up its strengths and weaknesses. I tried riding it on gravel around home first, and it performed much better than the Suzuki, especially when loaded to the hilt. It had more power, better wind protection, better comfort, and it handled better, especially when fully loaded. I planned to visit Donna and her family in Anchorage for a few days during the tour. 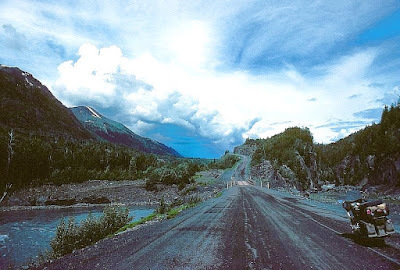 I toyed with the idea of venturing up the Dempster Highway to Inuvik, in the Northwest Territories if everything fell into place, but I knew when I left that it was unlikely, although the Gold Wing showed promise for a trip like that. I planned to stick primarily to interstate highways in the East, and I would use a relatively direct route through Canada, which should make it a quicker trip. I certainly don't favor riding on interstate highways. Day 1 - I left a month later than usual. The Honda’s odometer read 6,365 miles when I left after lunch on June 28th. I had no mechanical problems during the earlier break-in period. I rode through light rain near Yonkers Raceway, which stayed with me through New York City. The expressways were a little slick from fresh rain on the heavy oil drippings from the trucks. I didn’t put my rain suit on until I met the first of several heavier showers in central PA. I used mostly I-80. It rained heavy most of the way. When I reached the Motel 6 near Youngstown, Ohio around 9:45 PM, I was wet underneath and the bike seat was a little wet. Day 2 - A car belonging to people in the next room was broken into during the night. Police were outside investigating when I got up at 5:30. I suspect they had little hope of finding whoever did it. I was relieved that the bike was untouched. I was on the road by first light. The mirrors vibrated out of adjustment several times before I realized that the front tire had far too much air in it. It got quite warm along the Ohio Turnpike after the sun came out. The interstate soon became tiresome, so I got off and tried some two-lane roads through southern Michigan, mostly US 12. After only about 100 miles of that, I returned to the interstate. I didn’t find much interesting, and there was far too much local traffic, which I wasn't in the mood for. I was anxious to get to the Canadian roads and the Alaska Highway. The weather was fairly good while bypassing Chicago on I-80. I rode through one heavy thundershower near Peoria. Soon after crossing the Mississippi River at Davenport, I saw one of the most unusual skies I had ever seen. The thick dark clouds swirled like cars in a demolition derby. I suspected a tornado was brewing, so I pulled into a rest area where many cars were doing the same. People stood outside watching the strange show as the sky got darker and the huge black clouds swirled even faster. Soon it began to rain, accompanied by strong winds, although I didn’t see any sign of a funnel cloud. I stayed at the rest area until the rain and wind eased, and I left in my rain suit. I didn't get far before the next downpour forced me to look for shelter under an overpass. I stopped under several that afternoon, during the heaviest rains, and I reached Des Moines around 9:00 where I found a small motel near the airport after 775 miles for the day. Day 3 - I located a small café ten miles out of town and had a full breakfast of sausage and eggs. Most of the fields were flooded from the recent rains, and many of the rivers and streams were over their banks. Most of the cornfields and soybeans I saw in Illinois and Iowa were flooded. I explored a few interesting country roads in Iowa where I saw many feedlots for cattle and hogs, but I saw mostly corn. The scenery in the rolling hills and small farms of central Iowa were more picturesque than in Ohio and Illinois. The temperature rose into the 90s in Nebraska, where I stopped for a quart of milk. I was drowsy after drinking the whole thing, so I stopped again for a large Pepsi to wake up. I pulled into Chadron, NE just before a heavy thundershower and ducked into a restaurant for a sit-down dinner during the downpour. It stopped raining by the time I left, and I saw a huge rainbow in the east. I rode for a few more hours before locating a motel in Lusk, WY where I called it a day around 8:00 after 760 miles. The Gold Wing was much more comfortable than the GS750 Suzuki, and didn't give me the pain between my shoulder blades. Day 4 - After a full breakfast at a small café in Lusk, I was on the road by 7:30. The temperature rose into the 70s by midmorning. I decided to head for Yellowstone Park with the intention of possibly camping inside the park that night. I stopped at a deli in Thermopolis, WY where I got a sub for lunch and saw the famous hot spring, which is a pool of clear, hot, sulfur water in the middle of town. It was hot and dry in Thermopolis that day. I rode through Big Horn National Forest, Casper, Buffalo and Cody, on my way to the park. I didn't realize it was Friday, going into the July 4th weekend until I got deep into the park and saw that all of the campsites were filled, and the place was packed. I couldn't even find a spot big enough to pitch a tent. I eventually rode more than a hundred miles in cold drizzle and sleet to exit the west end of the park. I had quite a burn on my face and the backs of my hands from the sun and wind. The last two hours of the day seemed like an eternity because of slow traffic. I was tired by the time I got to West Yellowstone, MT, well after dark. It was crowded there too, and I was fortunate to find the last room in town. After checking in, I heated some canned stew on my camp stove in the room. Day 5 - The temperature was in the mid 30s when I left. It had snowed a few inches in the park during the night, which made me glad I didn't camp. I was on the road by 7:00, wearing most of my clothes, including the rain suit. I stopped less than two hours later in Idaho Falls to dig out my snowmobile top. It was cold and wet for my entire Idaho loop, which was to be one of the highlights of the trip. I planned to take a lot of photos. I had bought a new Pentax K1000 before leaving, but unfortunately I never took the time and effort to get acquainted with it before leaving. As a result, most of the photos I took on the trip were very poor quality. I saw several elk in the first few hours, and I visited Craters of the Moon and Sun Valley. I ran into a brief snow shower at Galena Summit and began to look for a room around Cascade. I finally found one in McCall. The proprietor said she turned down several groups of young people because she was afraid they might tear her place up. I was surprised she rented the room to me, a biker. The room was reasonably priced and had a queen-size bed. I filled the tub with hot water and soaked my cold, aching body for a long while. Day 6 - There was thick frost on the seat when I came out in the morning. It had gotten down into the low 20s during the night. I ate breakfast at a nearby café with a couple from Alberta who were touring with a Yamaha Venture. I spent most of the day taking pictures in scenic areas of western Idaho and Washington. None of the photos turned out very well. I enjoyed a nice ride along the Salmon River Canyon before heading for Grand Coulee Dam where I turned onto US 97. I headed due north on it and stopped a few times for Bing cherries to snack on. I eventually located a nice motel in Kamloops, British Columbia. Day 7 - I woke a few times during the night with cramps in my legs, which I usually attribute to dehydration and a shortage of potassium. I had a headache and my ears were ringing, which might also be from dehydration. My face was also swollen from the sun and wind. I was having flashbacks of the previous tough trip. I even wondered why I was doing this thing that I had already done twice before. I kept asking myself if I was ready for this. I felt low, and I skipped breakfast. I rode about an hour before stopping at a small restaurant in Cache Creek. It was a steady climb from there to 100 Mile House. The first forty miles or so was treeless, but I was soon deep into the British Columbia forests. I spent about a half hour at Williams Lake cashing a few travelers’ checks for Canadian currency, after which I stopped for lunch in Quesnel. I encountered a few showers between Prince George and Vanderhoof before stopping for the night in Smithers. The rear tire that I originally thought would take me all the way to Anchorage looked almost worn out already. I was carrying the new replacement, so I decided to change it before starting up the Cassiar Highway. It was my first experience changing a tubeless tire on the road, and unfortunately I forgot to pack the tool to break the bead. I struggled with it for almost two hours, mostly trying several different ways to break the bead. After succeeding, I realized it was a low profile tire, even though the markings on the tire indicated it was the right size. It lowered the ground clearance almost an inch. It was definitely the wrong tire for the bike. I even thought of aborting the trip. I wondered what ever possessed me to take the trip in the first place. I was totally out of shape for the rigors that I would probably face in the second half of the northbound leg. I wasn’t sure I had enough strength at that point to make it. Things just weren't going well. Day 8 - After a good night's sleep, I kept going and crossed the Skeena River onto the Cassiar Highway. It was partly cloudy and 55°. There were very few vehicles on the Cassiar that morning, which I was thankful for. The dirt began about 10 miles north of Kitwanga. There wasn't much left of the original narrow logging road that I traveled in 1977, six years earlier. Some of it was 40 feet wide, while the swath cut into the forest was more than 200 feet wide. 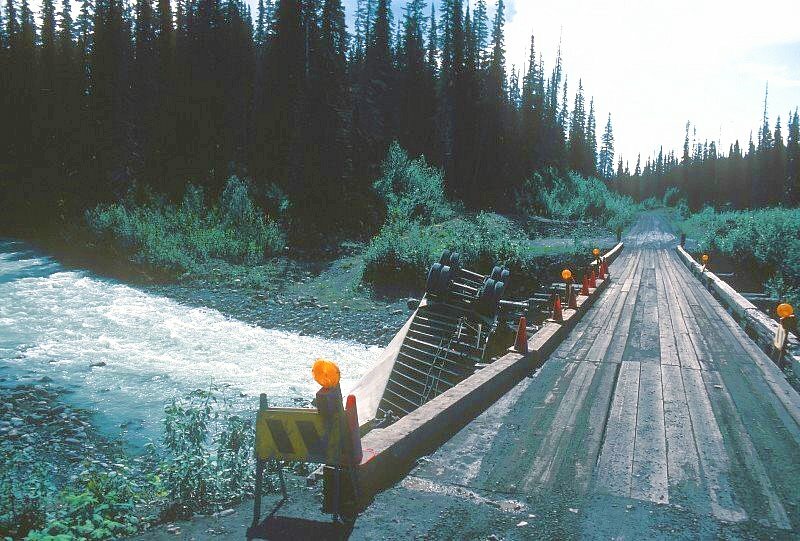 The total swath cut on that part of the Cassiar was ten times what it was when I traveled it in 1977. I averaged between 50 and 60 mph most of the way. The Gold Wing handled well on the packed gravel. I saw a few trucks disabled with flat tires in the construction areas, around where many huge sharp rocks were spread across the road. The stones flew up under the bike and struck loudly against the bottom. It was made worse by the low ground clearance. I thought about all of the stones on the Dempster Highway, and I figured if I were to attempt it with the ground clearance the way it was now, I would certainly have problems with the millions of sharp stones. I saw what appeared to be a pure black mink run across the road, and I passed a fire-ravaged area that went on for 20 or 30 miles. I had heard on one of my earlier trips that some of the natives set the fires deliberately so they can be hired to put them out. Truck that missed the bridge and overturned. The natives also find work planting new trees for years after a fire. It rained hard for about ten miles, which made the surface quite slick. I reached the Alaska Highway junction around 7:30 PM and turned east to locate a room in Watson Lake just as it was beginning to drizzle. The Gold Wing generally handled well on the Cassiar. I didn't care to camp in the rain with memories of the previous trip fresh in my mind. I found a tiny room in an old mobile home in Watson Lake for $40. I was tired after having traveled 580 miles of mostly packed dirt and gravel, much of it wet. I could hear heavy rain beating against the metal roof all night. Day 9 - It was still drizzling when I got up. I decided during the night to definitely not make an attempt at Inuvik, and I was fine with the decision. I rode through mostly drizzle for about two hours on the Alaska Highway. After it stopped, I held my speed between 65 and 80 mph for a long while. The gravel surface was smooth and firm with very few stones. There were sections before and after Whitehorse that had recently been paved with smooth blacktop. I cleared US Customs and entered Alaska around 6 PM. Twelve miles beyond the border, I rode through eighteen miles of road construction where the mud was deep and very slick. Cars and RVs were getting stuck all over the place. The construction crew would hook a chain onto a vehicle in the mud, and drag it all the way out, sometimes for miles. I had to wait for a half hour for the pilot car. While following it through, I was stopped several times as cars and campers would get stuck in front of me. Luckily my ground clearance didn't cause major problems. To avoid it, I stayed in line in a muddy rut for the entire distance. I lost about an hour due to the construction. I was low on gas when I entered it, and when I finally found a gas station beyond the mud, I was on my last few ounces of reserve. I picked up groceries in Tok around 8 PM, and stopped at the same state-run campground I used two years earlier, about 14 miles past Glennallen. I covered 680 miles in the fourteen-hour day, mostly on gravel, which was good for any type of bike. The Wing performed exceptionally well. Day 10 - The day began with only a few clouds around. The road was paved from where I stayed, all the way into Anchorage, but it was rough. I hit a few breaks in the pavement that caused the bottom of the bike to slam hard against the road. I hit one dip doing about 80 where the bottom hit so hard it threw me clear off the seat. I hit another dip on a curve, traveling about 55, and the side hit the road so hard that it threw the bike across the centerline. Fortunately, the bike was forgiving. I traveled faster than usual for most of the last few days. I'm sure the low-profile tire on the rear caused most of the bottoming problems. The sky was completely overcast by 10 AM. I rode through rain and fog at Eureka Summit, as I did on both previous trips. It was also raining at Matanuska Glacier. I experienced what felt like a series of bumps in one area, and a strange unevenness in the road. All of a sudden stones began falling from the steep embankment onto the road. I learned later that a 6.2 earthquake struck the area. It felt really weird on the bike at speed. I’m quite sure the road was bouncing around underneath me. I reached Anchorage just before noon on Thursday. My odometer indicated 5,800 miles from New York. I had averaged 650 miles per day for nine days. It was a quick trip, especially for the conditions. I relaxed at Donna's for the rest of the day and spent Days 11, 12, 13 and 14 visiting. I serviced and cleaned the bike while I was there. I learned from talking with a mechanic at the Honda shop that the coolant temperature problem I thought I was having was probably due to a defective gauge, which is the only related part they’ve had problems with on that model. I was unable to find the type of oil that I normally use, or the correct spark plugs, so I chose Pennzoil for the oil change and decided not to change the plugs yet. Rey smoked about four pounds of salmon for my return trip. He also made caribou jerky for snacks on my trip back. Day 15 - I left Anchorage for home in a light rain, which continued intermittently until just before I got to the construction area east of Tok. I arrived as the pilot car and a string of vehicles were disappearing from view. I had to wait for more than an hour for it to return. By that time, there was quite a string of cars and trucks lined up behind me. The pilot car driver, a girl, took one look at the bike and said, "You will never get that thing through here this morning!" She said most bikes were getting stuck the day before when it wasn't half as bad as it is now. I told her not to worry, but she insisted that if I were going to try, I would have go to the very end of the line. She said she didn't want me “holding up anyone or getting run over”. I did it without an arguement. After watching 20 or 30 cars, campers, trucks and other vehicles go by, I moved in and took up the rear. It turned out to be a real fiasco. Vehicles were getting stuck all over the place, especially the large RVs and cars with trailers. Several vehicles would try to make their own tracks, and would eventually get buried to their axles in mud. Bulldozers and other four-wheel-drive construction vehicles would then hook chains onto the cars to drag them out. I remembered that operation from the trip north, and mentioned it to a guy in line with a VW Beetle this time. He said no one was going to mess up his front end by dragging him through the mud. I don't know how he ever got through, but the last time I saw him he was buried well over his wheel hubs in the mud. He was one of those who tried to make his own track. The entire roadbed began to look like a huge parking lot as many drivers would get tired of waiting in line and try to make their own path. I generally kept to the firmest tracks, even though it sometimes meant waiting a few minutes. I only climbed out of the main rut a few times to get around people who were seriously stuck directly in front of me. I almost got stuck once as I squeezed by a guy because it was much softer a foot out from the packed-down wheel tracks. I paddled my feet in the mud to keep it going, and I tried to stay as close as I could to the string of cars. It was obvious the mud was much deeper farther out. With my low clearance, the bottom of the bike was dragging in mud. It took about two hours to get through the eighteen-mile section. When I finally reached the hard surface, about two-thirds of the vehicles that went in ahead of me were stuck far behind. I gave a big wave and a smile to the pilot car driver, who I think was amazed that I got through at all. By then I was close to the head of the pack. After clearing the construction, I stopped for gas and couldn’t locate my credit card. I searched everywhere that I thought it might be, and I was convinced I had lost it. The last place I remembered using it was at a Chinese restaurant in Anchorage the previous night where I had dinner with Donna and her family. The kids were unhappy and uncontrollable. Asia kept running around and crawling under the tables while Robyn screamed nonstop from his highchair for the entire time we were there. I was a little rattled from the screaming, spanking and yelling. I couldn't remember what I had done with the card, or even if I got it back from the cashier. I called Donna and asked her to look around and check with the restaurant to see if anyone found it. I called again from the Canadian border a half hour later. When it wasn't found, I called the Visa company to have it canceled. The whole thing cost me almost 3 hours and left me without a card. I wasn’t carrying very much cash either, and I had no travelers’ checks with me. I continued to ride for several hours beyond the border and stopped for the night at Burwash Landing on Lake Kluane around 11:30 PM. It was a stressful 16-hour day. Because of the credit card problem, I was now on an even tighter budget for rooms and food. I rented an upstairs room with a shared bath for $25. The cots were small but comfortable. I ate smoked salmon for dinner from my bag. Before turning in, I found the card in a pants pocket that I wore the previous night, but it was too late since I had already canceled it. I felt dumb for not thinking about the pants. Day 16 - I slept until 8:30 and had breakfast at the lodge. I was on the road by 10:00. The roads were dry and the sky was clear. I took several photos around Lake Kluane, which is one of the most scenic spots along the Alaska Highway. I rode between 70 and 80 mph most of the day on mostly unpaved surfaces. A few of the paved sections had patches of soft gravel, which were tricky. But for the most part, the road was hard-packed gravel, treated with calcium chloride and recently graded. I ran through a few light rain showers between Whitehorse and Marsh Lake. 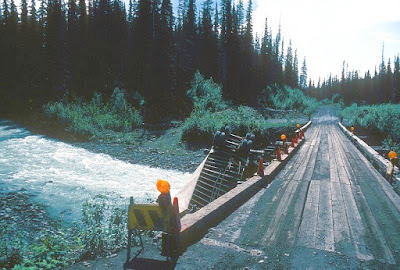 I crossed the steel-grated bridge over Teslin Lake while it was dry, although the Gold Wing took the grooves much better than the poorly-loaded Suzuki. I was able to go much faster and feel confident. I ate smoked salmon around 6:00, and kept riding for a few more hours to Muncho Lake where I camped. I had a little trouble finding a clear enough spot along the lake to pitch the tent, and I finally settled on a spot covered with stones near the edge of the water. I covered about 600 miles that day, almost all gravel. Day 17 - The day started out clear, breezy and in the low 60s. I rolled up everything dry for a change, and left at 8:00. I had a nice ride through the scenic mountains around Steamboat and Fort Nelson. I eventually ran into rain about ten miles short of Pink Mountain. Just as a downpour was at its peak and accompanied by pea-sized hail, I came upon another construction area where I slipped and slid for about 20 miles through it. I rode through several showers for the next three hours before stopping at a motel in Fox Creek, BC, along Rte 43, around 9:00. Day 18 - I started out at 7:30 in a steady rain after eating having more of the smoked salmon for breakfast, along with an onion roll and coffee. I was supposed to be on a low-salt diet, but I didn't have much choice after canceling the Visa card. The temperature was in the low 50s and very comfortable. The sky began to clear around 80 miles out. The sun was out by lunchtime, and it was nice for the rest of the day. I stopped at 8:30 in Saskatoon for the night after 725 miles. I ate smoked salmon for both lunch and dinner that day. By the time I got to the motel that night I was beginning to get tired of the steady diet of smoked salmon. I was sure I had consumed far too much salt for my heart problems and my blood pressure. I went out for a liter of milk at a convenience store, and I found a KFC for a late snack. DAY 19 - I was up at 6:00 and out by 7:00. I had breakfast in the room on smoked salmon again with rolls and coffee. A cold front was supposed to be heading my way, but the day started out clear and 60°. I entered the US at Portal, ND and soon began to see a lot of motorcycles that I assumed were associated with the Sturgis rally. I had seen many grain elevators in Saskatchewan, and I saw many silos in Minnesota. I hoped to make Au Claire, Wisconsin by nightfall, but I ran into rain again and stopped a few miles short of there at a small motel I found about a mile off the interstate. I went out and got some greasy fried chicken after the rain stopped, which I carried back to my room. Day 20 - I was up at 5:30 and on the road by 6:15 in a thick fog. It warmed up quickly, so I stopped around 9:30 to peel off a few layers of clothes and my face shield. I rode on interstates most of the day through Illinois, Indiana and Ohio, stopping several times for water, soda and an ice cream as the temperature rose into the 90s. I felt groggy and sleepy several times during the day. I stopped at the same Motel 6 in Ohio that I used on the way up. Day 21 - I was up at 5:00 and on the road by first light, around 45 minutes later. I rode for a long while looking for a place to stop for breakfast. I almost ran out of gas before I finally found a truck stop where I filled up and had a good meal. I opted for Interstates 81 and 84 to get home, which I realized was considerably quicker and more scenic than my usual ride through NYC. It was also cooler through the Poconos than it would have been through New Jersey. I traveled 4,450 miles from Anchorage in 6½ days, averaging 685 miles a day for the return trip. I was very impressed with the 4-cylinder Gold Wing as a reliable adventure touring bike.